ROMAN NIGHTS at Theatre Reznicka, Prague. Fresh from a sold-out run of THE SWEET LIFE at Soho Rep/Walker Space in June 2001, TIME TO STORM in association with HERE and Michael Kagdis' CuriousArts presented Franco D'Alessandro's WORLDS COLLIDE… at the bottom of a glass -three short plays by the award winning playwright. This innovative evening of fresh theater featured live musical performances by Josh Joplin, a sort of Oprheus, who served as a guide through the three plays. Is That You or Is That Me? Is a futuristic story dealing with the triumph of love in the face of one-upmanship and rabid consumerism. And On… is both a searing and poetic look at three generations coping with loss and love and how family influences our emotional mind-set. The evening culminates with Before and After, a double play, which has contemporaneous stories unfolding. It is alternately scathing political satire and drama, which examines life before and after the September 11th catastrophe. The production was dedicated to TTS founding member, actor Kevin Cleary, who was killed on 9-11. The evening's plays were directed by Jared Coseglia, Michael French, and Eva Minemar and presented by TTS Artistic Director John-Dylan Howard. The production ran from Wednesday December 19th through Sunday December 23rd 2001 at the HERE Arts Center - the Dorothy Williams Theater 145 6th Avenue (between Spring and Broome Sts.). 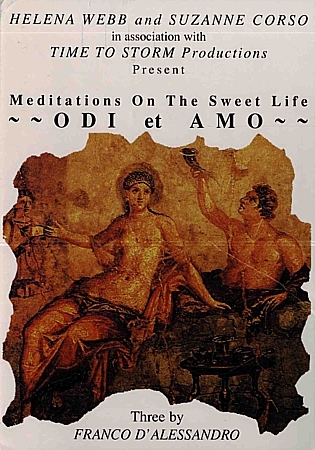 The Sweet Life: Odi et Amo, which takes its inspiration from a poem by Catullus, is a sarcastic reference to both the over indulgence of modern life and Fellini’s La Dolce Vita. In these three One Act Plays; themes such as love and friendship, fidelity and betrayal and want versus need, are skewered with the wit and poetry that is typical of D’Alessandro’s writing. “My Little Love Gun” captures with eerie beauty and dark humor, the feeling of being caught in a dream, that is an unfortunate reality for many. “Waiting Station” takes a painfully close look at friendship and our delicate need for and fear of human contact. “Jesus, Mary and Joseph!” is a jarring tale of a husband and wife, who are so caught up in their high-pressured jobs that they do not see what they really want in life. The appearance of a mysterious ‘heaven-sent’ third character ultimately makes sense, not only in context of all three of the evening’s plays, but also in reflecting the author’s vibrant, sharp and unmistakably Italian sensibility. The Sweet Life: Odi et Amo –Three by Franco D'Alessandro, explores a variety of modern relationships, sexual and platonic. These three One Act plays deal with love and friendship and the moral obligation we have towards one another as sentient and loving beings. The combination of social sarcasm and references to classical poetry in Meditations on The Sweet Life echoes the author’s Italian culture and influence by Fellini, Wertmuller, and Zavattini and other neo-realists of Italian literature and cinema. 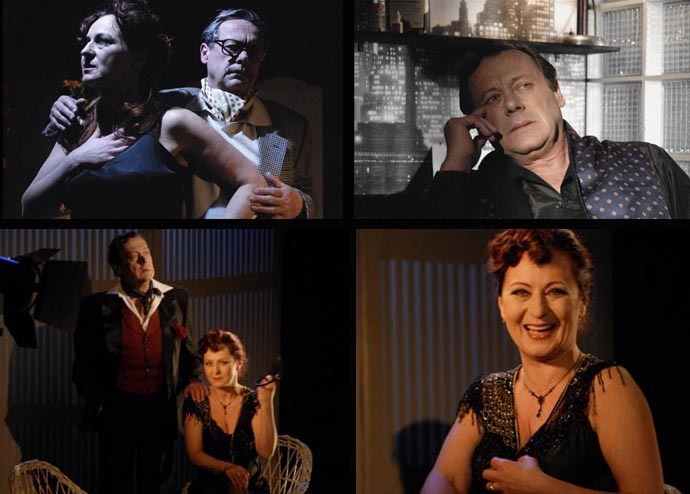 The author’s apprenticeships with American playwright Edward Albee and Italian writer/director Lina Wertmuller has influenced these three social commentary plays that are inspired by the abstract expressionist movement of the 20th century. In the award winning “My Little Love Gun” a woman’s waking dream collides with the reality of her husband and his perspective on life, love and their marriage. In “Waiting Station” two men are waiting for a train at a station, and it is unclear as to whether or not they are old friends or perfect strangers. What becomes clear is that one of these people has hurt someone, sometime ago and feelings of guilt and remorse drive the story, much like the train that is barreling with gaining speed towards them. In “Jesus, Mary and Joseph” a high-powered Wall Street woman named Mary learns to be careful of what she wishes for, as she contemplates having a child with her equally stressed out husband. When a stranger appears and offers to give her all the things she has longed for, she must confront the reality of who and what she is. Drawing from classical Latin poetry such as Ovid, Catullus and Propertius… these modern plays try to answer some eternally perplexing questions…How healthy or unhealthy is it to define ourselves in terms of our relationships with others? What happens when we take away our love? What happens when we are too frightened to articulate exactly what we need and want in our lives and relationships? What happens to our minds and sense of morality, when as human beings we are neglected in terms of love and understanding? These are the bitter and sweet aspects of love that are illuminated in The Sweet Life: Odi et Amo – Three by Franco D’Alessandro. Somewhere between a dream and a memory. An Apartment Bedroom in New York City. A train station –Anywhere. Late Fall. An Apartment and Restaurant in New York City.